On the 18th (Thu), contemplate in the serene atmosphere at Siyali Mahadev Temple, take in the spiritual surroundings of Hidimba Devi Temple, indulge in some personalized pampering at some of the best spas, then appreciate the views at Solang Valley, and finally explore the activities along Beas River. Keep things going the next day: take in the spiritual surroundings of Manu Temple, then admire the sheer force of Jogini Waterfall, and then get in on the family fun at Himvalley Manali Amusement & Culture Park. Before you visit Manali, use our trip planner to discover what you can do and see there. New Delhi to Manali is an approximately 3.5-hour flight. You can also do a combination of flight and taxi; or drive. Finish your sightseeing early on the 20th (Sat) to allow enough time to travel to New Delhi. On the 20th (Sat), take in panoramic vistas at Qutub Minar, take in nature's colorful creations at Humayun's Tomb, then see the sky in a new way at Jantar Mantar, and finally examine the collection at National Museum. 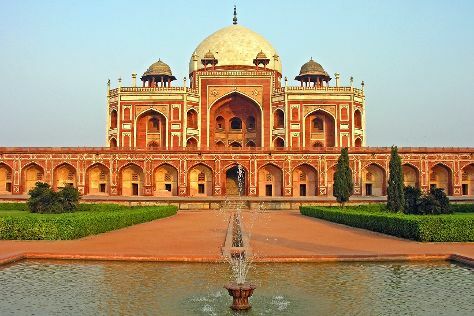 For traveler tips, more things to do, photos, and tourist information, read our New Delhi trip maker tool . You can fly from Manali to New Delhi in 3.5 hours. Alternatively, you can do a combination of taxi and flight; or drive. In April, daily temperatures in New Delhi can reach 43°C, while at night they dip to 25°C. Finish up your sightseeing early on the 20th (Sat) so you can travel to Mussoorie. Kick off your visit on the 21st (Sun): take your sightseeing to a higher altitude at Gun Hill, then stop by Hamers, then take in the dramatic scenery at Kempty Falls, and finally walk around Company Garden. For ratings, more things to do, other places to visit, and tourist information, refer to the Mussoorie trip itinerary planner . Getting from New Delhi to Mussoorie by combination of flight and taxi takes about 3 hours. Other options: drive; or take a train. Finish up your sightseeing early on the 21st (Sun) so you can travel back home.